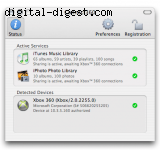 Druid is an easy to use conversion tool for Microsoft Media Center editions, including Vista. Simply select the TV recordings you wish to transcode from the checklist and click Convert now! Freevo is an open-source home theatre PC platform based on Linux and a number of open-source audio/video tools. MPlayer and/or Xine can be used to play audio and video files in most popular formats. GeeXboX is a free embedded Linux distribution which aims at turning your computer into a so called HTPC (Home Theater PC) or Media Center. Got All Media is a Home Theatre PC media center that allows you to watch, record, timeshift and manage your TV shows and DVDs. Here comes a new media experience. Immerse yourself in entertainment with Moovida’s open and free media software, where you can access and play all your digital videos and music from the interface best fit for your screen, whether desktop or tv. MythTV is a GPL licensed suite of programs that allow you to build the mythical home media convergence box on your own using Open Source software and operating systems.